We apply our years of knowledge to assist our clients meet their goals. At the age of 33 Todd was an out of shape corporate employee. Weighing in at 92 kg he decided to make a change to his lifestyle. A healthy exercise habit ensued resulted in weight loss but with no challenges to test the fitness, a gym routine became boring. In 2009 Todd did his first Triathlon and was hooked. Now a 7 time Ironman, 12 time 70.3 and multiple shorter distance event finisher. Todd has competed in the 2013 70.3 World Championships and the 2016 Hawaii Kona Ironman World Championships where he finished in 9:56:37. Capped by a 115th over all run time of 3:21:07. 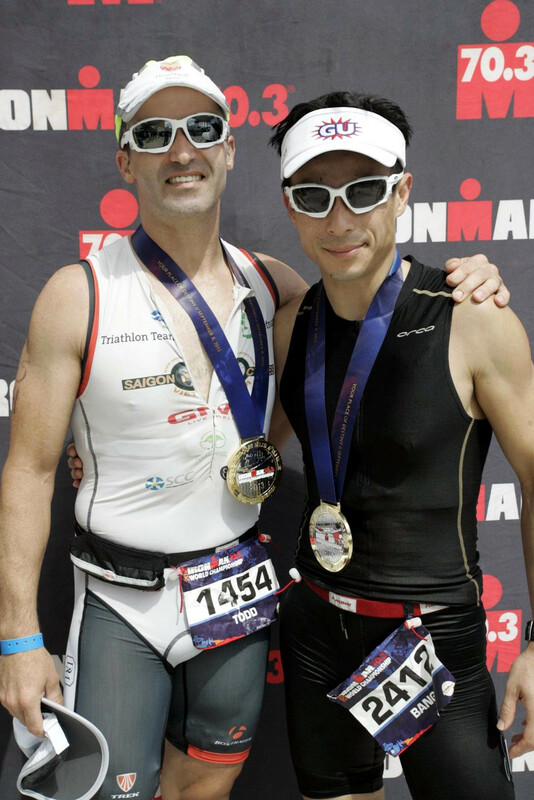 Five weeks later at Ironman Malaysia in Langkawi, Todd finished 3rd in his age group and earned another Kona Slot with a finishing time of 9:58:33. Bang is a multi-sport athlete who has been participating in Triathlons since 1997. He is a 3x Ironman and 15x 70.3 finisher. He competed in the 2015 Ironman World Championship and the 2013 and 2016 Ironman 70.3 World Championship. Bang is an Endurance Academy Mentor and training partner of Todd's. Together to your finish line!